Ceiling fans not only save you money on your energy bills, but they also provide a design accent that looks great in any room. This is especially true of ceiling fans with lighting fixtures that can be directed at specific points in the room. 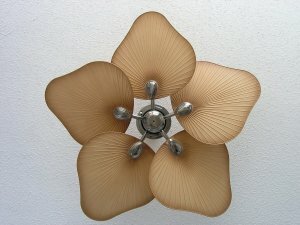 If you are interested in a new ceiling fan, come to Wright Lighting and Fireside, where we have a great selection of lighting and ceiling fans in San Jose . In this article, we will review some tips that should help you choose the ceiling fan that is right for you. The American Lighting Association has recommendations on their website for how to match the size of the room to the appropriate ceiling fan size . If the room is 75 square feet or less, the fan blades should be 36 inches or smaller. If the room is between 75 and 144 sq. ft., buy a fan that is between 36 and 42 in. For rooms that are 144 to 225 sq. ft., a fan that is 44 to 50 in. is appropriate. Rooms that measure 225 to 400 sq. ft. need a fan that is 50 to 54 in. If you have an even larger room with high ceilings, talk to one of our lighting experts about installing a fan with 60 to 80 in. blades. Remember that size is not just about style and scale; it is also about function. Head clearance is important to consider if you are installing a ceiling fan in a room with low ceilings. A flush-mount model, called a ceiling hugger, can provide the head clearance you need. You may need a hanging rod or extension rod to ensure the ceiling fan is 8 or 9 feet from the floor. If you have lighting on your ceiling fan, install a remote-control system that can change the speed of the fan and the intensity of the light. This way, you will never need to get up and pull a cord every time you want to adjust the fan or lighting.